It was over in 1.9 seconds. A skeletal metal sled accelerated down a track at 2.5 times the force of gravity, hit 116 miles per hour, and crashed into a sand pit, sending a cloud of dust dramatically into the air. It was the first public test of Hyperloop One's acceleration technology, an early step toward building a new kind of high-speed transportation system. "I would really like to note that all of that happened on purpose!" said a giddy Brogan BamBrogan, Hyperloop One's cofounder, after the test was over. First proposed by Elon Musk in 2013, the Hyperloop envisions sending passengers on levitating pods through partially pressurized tubes at more than 700 miles per hour. Musk open-sourced the idea and now a number of startups are competing to make the technology their own. Hyperloop One was cofounded in 2014 by BamBrogan, a former SpaceX propulsion engineer, and venture capitalist Shervin Pishevar. The company recently raised $80 million in funding and has more than 150 employees. It changed its name from Hyperloop Technologies this week to avoid confusion with the next closest competitor, Hyperloop Transportation Technologies. 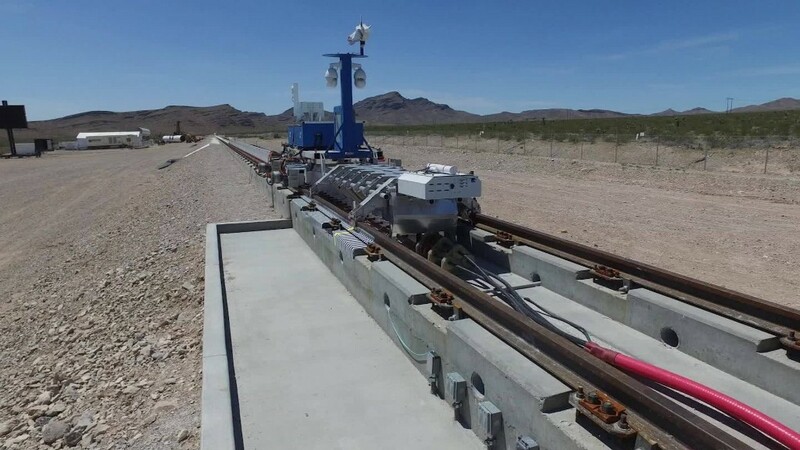 Based in Los Angeles, the company started building its test track on a patch of desert 30 minutes north of the Las Vegas Strip just six months ago. On Wednesday, it bussed in reporters, employees, partners and family members to watch the blink-and-you-missed-it test run from a grandstand. Down the hill, a control room of engineers counted down the launch. All employees cleared the track area, which was alive with 7,000 volts of electricity. The 1,000-yard open-air track is just the first part of a larger test track that Hyperloop One is building here. Sections of giant empty tubes sit nearby, each 3.3 meters in diameter and branded with the Hyperloop One logo. They'll be used to build a 1.5 kilometer enclosed track. Then the company will start testing technology that will allow the sleds to levitate. Because the sleds will glide, passengers will only feel the initial acceleration, similar to the start of an airplane ride. The company is moving fast. "All of this is to get us into a position to run this full scale, full system test later this year," said Pishevar. Hyperloop One's ambitious plan is to start moving cargo by 2019, and carrying passengers by 2021. It recently announced partnerships with a number of well-known transportation companies around the world and is looking into locations for its first commercial track. Wednesday's test run didn't break any speed records or even look particularly dazzling up close, but for the Hyperloop One employees who have been working 12 hour shifts around the clock for months, it was a momentous occasion. "This is rad, and it's going to get a lot radder from here," said BamBrogan.